EspañolThe American dream is only 150 kilometers away for Cubans, the distance between the outermost point of the island and the south of Florida. For many years, this maritime strait has been the route to freedom for thousands of West Indians who embark on this journey, their lives at the mercy of the ocean, hoping to reach North American soil. It is the shortest route, and one which 12 refugees took this past Tuesday before reaching the coast of Miami Beach. Recently, after the normalization of diplomatic relations between the governments of Barack Obama and Raúl Castro, Cubans have been opting to travel by land in order to satisfy immigration requirements. This route, however, is more dangerous and much longer. Their voyage starts in Ecuador, since Cubans are allowed to enter the country without a visa. From there, the migrants must cross through Colombia and all of Central America, in hopes of reaching the Mexican border with the United States. The Panama National Immigration Service (SNM) claims that between 2010 and 2015, the number of Cubans who have entered the country illegally has increased by 294 percent. This year alone, the Panamanian government says they have helped 8,745 Cubans who have arrived in the country through the forest region of El Darién. A young Cuban lady — she calls herself Samy — from Mariano, Cuba, is only 19 years old, yet works as a prostitute at the casino of a famous hotel in Panama. Her final destination is the United States, but she first needs to earn enough money to travel the roughly 4,400 kilometers that separate Panama from Texas. This young lady was able to cross the Colombian border through El Darién, at the easternmost end of Panama, with no risks beyond the dangers of being deep within the jungle. Before that, her flight from Havana landed in Quito, and after a four-day voyage on both sea and land, she finally arrived in Panama. “Well, the risk is always there, they could arrest you, take your money away, and do nothing to help you pass through. Something could happen to you on the way, but whatever, once you’re out of Cuba you have to take the risk,” she explains shyly, as she waits for her next client. For Cuban migrants, Panama is just the door to Central America. Of all the illegal Cuban immigrants in Panama, only 15 have accepted the authorities’ offer to return willingly to their country. “Some of them realize, after reaching Panama, the reality that awaits them, and they willingly ask to be returned to their country. For this return, they purchase their own plane ticket, and they are not charged with any fines. But this is a very low percentage,” Alina Mariscal, director of investigations at the Panama National Immigration Service, explains. Mariscals says that West Indian immigrants who arrive illegally in Panama, and are discovered by authorities, are offered medical attention and food, and given a citation to appear a month later before migration authorities. “They are assisted by the National Border Service (Senafront) and after they receive aid, the SNM takes over. Since the SNM lacks shelters with enough capacity to provide assistance to the amount of immigrants arriving in the country, the procedure we follow is to give them a citation. However, because their final destination is not Panama but the United States, they fail to attend, and continue their trip north,” Mariscal tells the PanAm Post. Samy arrived in Panama with 10 other friends; now all of them work as prostitutes. The goal is to save enough money to continue their journey through Central America and reach the United States, where she is sure she will be able to live legally. Samy admits, however, that she has no idea how’s she going to accomplish her goal, or that she’ll need to travel through six other countries to do so. She says they’ve told her the trip should take about a week. “You ask around, and see how everything goes, and that’s what they told us. You only need to be careful at the borders because of the police, but before continuing on, we have to earn enough to pay the people who can help us cross,” the young Cuban says. The reinstatement of diplomatic relations between Cuba and the United States announced on December 17, 2014, has encouraged a greater number of Cubans to leave the island sooner rather than later, fearing they may soon lose the right to live as residents on North American soil. Reports of Cuban migrants detained in Honduras, Costa Rica, Nicaragua, and Mexico are becoming more and more frequent. In Costa Rica, immigration authorities typically release illegal Cuban migrants once they are caught and processed for deportation, knowing that their stay in Costa Rica is only a temporary stop in their journey. In the case of Honduras, authorities usually intercept migrants at the Guatemalan border, near the Agua Caliente crossing. Local officials say each week Cuban citizens try to cross the border riding public transportation on their voyage north. 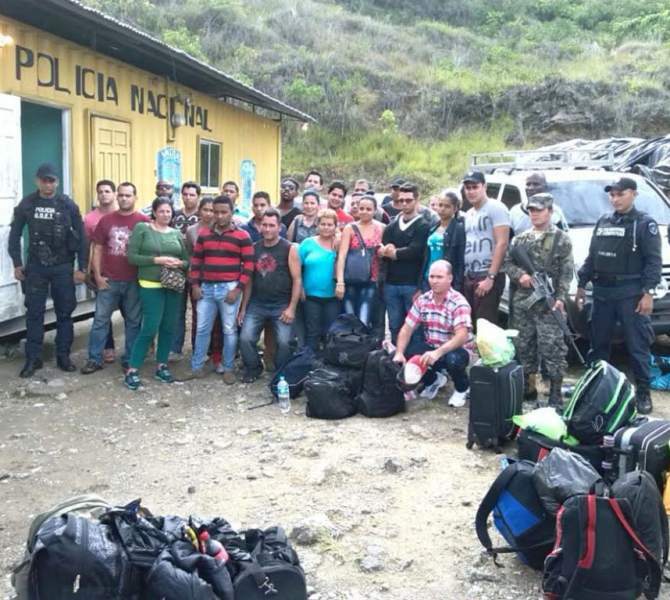 Local media reports that as of the end of August, police in Honduras have detained at least 1,800 undocumented Cuban migrants and handed them over to local migration services. The biggest fear among Cubans who opt to emigrate to the United States is losing the privileges offered by the Cuban Adjustment Act, which since 1966 has allowed them to reside legally in the North American country, as long as they meet certain requirements. In the meantime, while the rules remain the same, we can expect several thousands more Cubans to make the same arduous journey to reach North American soil. Thabata Molina is a Venezuelan reporter who focuses on public safety, violence, and penitentiary conflicts. She has contributed to national newspapers such as El Nacional and El Universal for 12 years. Originally from Caracas, she now lives in Panama. Follow @Thabatica.